Many people think that the saguaro cactus is Arizona's State Tree, but the palo verde is Arizona's official state tree. Palo Verde is a Spanish phrase meaning "green pole" or "green stick" and the name for two species of tree native to Arizona. The Blue Palo Verde (Parkinsonia florida) has blue-green branches and leaves, grows more quickly, and requires more water than the Foothill Palo Verde (Cercidium microphyllum), which has yellow-green branches and leaves and can live considerably longer than Blue Palo Verdes. The State of Arizona did not specifically name one of the two species as the state tree, so both are officially recognized. 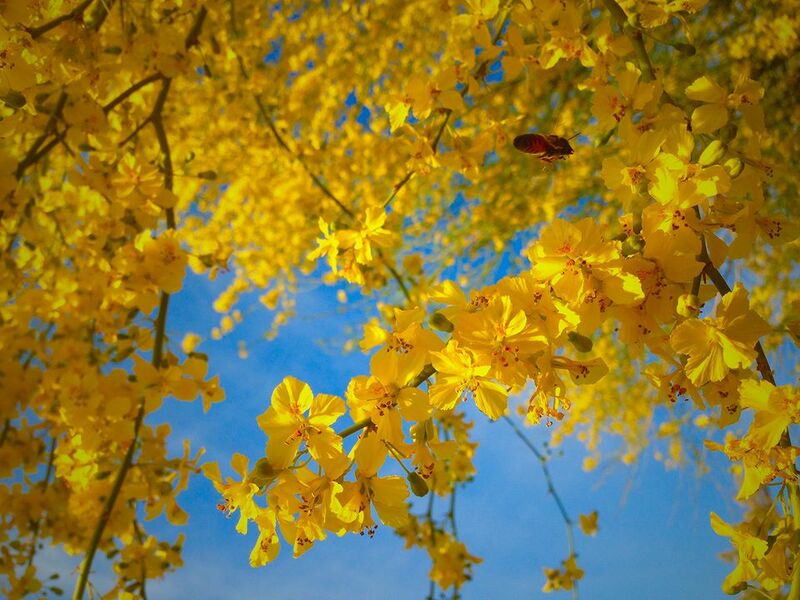 Blooming in the spring (around the same time as Arizona's wildflower season, typically in March or April), palo verde trees are magnificent trees that add vibrant color to the desert with their small yellow flowers. If you want catch a glimpse of these trees in the wild, they are native to southern Arizona, Sonora, and Baja, Mexico; it's best to visit in late March to see them in full bloom. Both species of palo verde trees can be found throughout southern Arizona, but they are especially common in the Sonora Desert, which covers much of the states as well as parts of California and Northern Mexico. However, if you're looking to see the Foothill Palo Verde specifically, they've become a cornerstone species in the Arizona Uplands, a subdivision of the Sonoran desert that's also become known as the Palo Verde / Saguaro Forest. This particular species of trees provide shelter and nourishment for vital members of the desert ecosystem and thrive in the area because it receives more rain than other regions of the desert. Blue Palo Verdes, on the other hand, require much more water and are typically found in desert washes called bajadas. In the natural Sonoran Desert these large, wide trees help to protect saguaro seedlings as the low, long branches provide shelter from the elements. Because this species is hardier and can survive longer on stored water supplies and dig deeper to find reserves, Blue Palo Verdes thrive in this environment, but can also be found in desert shrub habitats like in California's eastern Mojave Desert. If you visit the Sonoran Desert region of Arizona and want to buy one of Arizona's state trees for your yard, there are a few things to keep in mind about nurturing your own palo verde tree. Blue Palo Verde trees can grow rather large, rather quickly, so it's important to not plant them too close to your house or other structures you don't want to be completed invaded. They also require much more water than the Foothill species, so you're likely to have a higher water bill with these under your care. Whichever of the two you decide on, avoid planting them near your pool or hot tub as these trees drop their leaves twice a year and are thus considered "dirty" trees by gardeners and landscapers. Additionally, by planting palo verde trees you can sometimes attract Palo Verde borer beetles, which can get into your pool's filtration system.